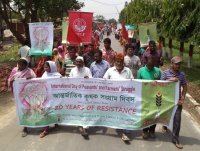 Bangladesh Agricultural Farm Labour Federation (BAFLF) and National Women Farmers & Workers Association (NWFA) have observed the International Day of Peasants Struggle to commemorate the massacre of landless farmers in Brazil as well as the recent killing of farmers and landless defenders for struggling their land, food and livelihood throughout the world including Bangladesh, Honduras, Columbia, Philippines and Brazil. To mark the Day, BAFLF and NWFA organized a rally in Gazipur, Dhaka. Farmers, women peasant and agricultural workers took part at that gathering to raise their demands for comprehensive and actual Agrarian Reform to ensure peoples’ food sovereignty. Subsequent to the rally, a meeting was held. Md. Mamun of BAFLF conducted the session. Among others who spoke at the occasion were Ruhul Amin, Abdul Rahim, Ashish Rojario of BAFLF and Rima Akter, Farjana Begum, Nurjahan Begum of NWFA and several other farmers’ leaders. The speakers at the meeting said that in 1980’s agriculture contributed 33.07% of GDP in Bangladesh but now this rate is decreasing. Farmers, during those days, controlled agriculture and had control over land, seed and water. Various government policies in the years that followed, took this control away from farmers. At this point, trans-national corporations and local private firms are dominating agriculture and they have also captured the agricultural market. Under the influence of powerful lobbies, government is pushing forth privatisation and commercialisation of agriculture and natural resources, resulting in farmers turning landless and poorer. The speakers also insisted that only a genuine agrarian reform can save farmers and small scale peasants. On behalf of BAFLF and NWFA, Golam Sorowor places 15 points specific recommendations for Comprehensive Agrarian Reforms. Farmers are real owners of agricultural land. The ownership of land is to be determined on the basis of the principal those who cultivate land are owners of that land. In the case of two-cropped land, maximum land ceiling shall be 15 bighas, and for one-cropped land, maximum ceiling shall be 20 bighas. Excess land shall be included in the khas khatian (khas land). Khash and fellow forestlands to be distributed among the landless people, and shall remain to be non-transferable. Permanent settlement should be given to those who have been living on the forestland for long time. Acquisition of agricultural land to be stopped for housing, industries and commercial farming purposes. Distribution, identification, demarcation and use of khaslands (abandoned land) to be handed over to the Union Perished Chairman. Rural and agricultural workers should be given the right to form trade union and the registration of their union be given in the authority of the Chairman. Assurance to be given by the government for minimum 200 days’ work in a year for agricultural workers as well as rural working people. Govt. should ensure guarantee for distributing khasland to indigenous, tribal and other marginal working people. There should be permanent settlement of land for the tribal. Decent living conditions and basic rights for tea workers, climate induced agri migrants and Bedes (Gypsy) should be provided by governmentt. To protect farmers’ land and to refrain marginalized farmers from selling their lands, strong laws stopping commercialization of agricultural lands must be implemented. For serving the interest of the farmers, digitalized land management system should be introduced to control corruption and forgery in regards land. Leasing system of public property such as hat, bazar, river, forest, water bodies etc. to be stopped. Government should promote cooperative farming and government incentives must be there to save the small scale farmers. Strong and effective market mechanism should be developed so that farmers’ access and control over the marker established. Subsidy to be continuing to protect farmers’ interest and to attain sustained self-sufficiency’ in agriculture. Government should promote the extension of sustainable and eco-friendly agricultural technologies. Embankments are to be planned safeguarding the natural motion of water of the rainy season. Establishment of dam in coastal areas must get priorities to save the coastal farmers from river erosion, flash flood and seal level rising. Organic fertilizers and alternative to chemical pesticides shall have to be used instead of chemical fertilizers and harmful poisonous pesticides. The use and import of GMO seed, GMO pesticides should be banned. Government should enhance capacities of public sector in seeds productions and distribution, more allocation for BADC must be ensured.